ITW Dynatec’s APEX High Speed Slot Die Applicator is an air-operated hot melt adhesive applicator assembly with an optional filter manifold. The applicator is used with intermittent pressure and constant pressure hot melt adhesive supply units (ASUs). APEX models are offered in six different module configurations. 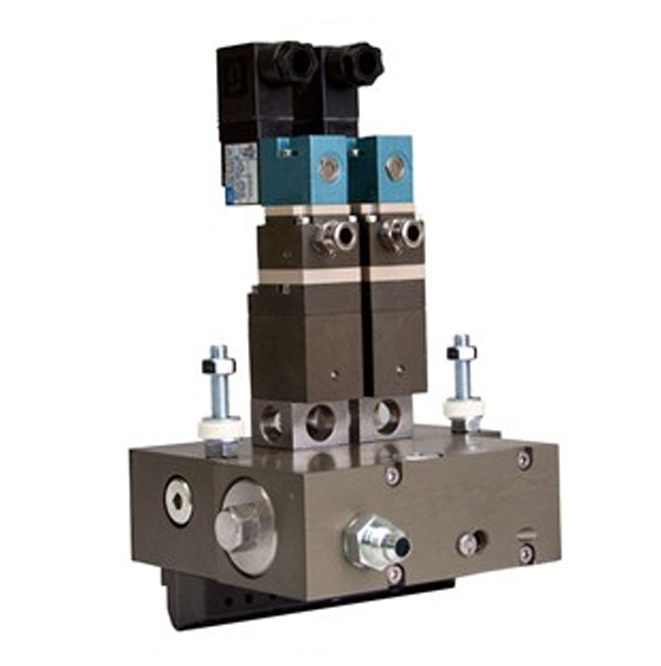 Each APEX High Speed Slot Die applicator features various combinations of adhesive valve slot die modules mounted to a single service block. Each module is opened and closed by air pressure. Springs are used to keep the stem seated when no air pressure is supplied to the head. The rate of adhesive flow from the applicator is determined by the adhesive pressure applied by the ASU’s pump, shim thickness and the amount of shim opening. The applicator is heated by replaceable cartridge heating elements which are controlled by an integrated RTD sensor and electronic control. A single heat zone for the service block and die allows for only one temperature control point on models less than 390mm. Models longer than 390mm have two heat zones and control points. The APEX module(s) is mounted onto either a steel or aluminium service block. A piston inside the module is pneumatically triggered by a solenoid, which allows adhesive to flow through a valve within the module. The APEX offers a variety of heated adhesive supply hose connections into the service or filter manifolds. Adhesive flows from the hose into and through the channels within the manifold to the module. Air pressure opens the adhesive valve, allowing adhesive to flow through the module’s die assembly when the valve is open. These slot die applicators can be configured for either ITW Dynatec’s DynaControl controller, Microprocessor Temperature Control/ Compu- Vision (MCV), DynaPlus/ Pro or it can be configured for a competitive upgrade.